Pedestrians bundle up in sub-freezing temperatures on the campus of the University of Nebraska at Omaha, Jan. 30, 2019. The weather people claim March 1 is the start of “meteorological spring.” But March 1 arrived Friday and this alleged, conjectured, hypothesized meteorological spring was a no-show. Dare we say, it flaked on us. Much of the continental United States is cold, wet and stormy, with the notable outlier of South Florida, where for many weeks it has been summer. A brutally cold Arctic air mass punched into the nation’s midsection this weekend and will deliver shockingly low temperatures for a vast section of the country east of the Rockies for the next couple of days. The National Weather Service said Saturday that temperatures between Montana and Kansas could be 50 degrees below normal. The Arctic blast is a repeat of what happened in January, when the polar vortex — the very cold air mass that normally circulates in the Arctic — broke into pieces, with a fragment hurtling south and creating dangerously cold conditions in the Lower 48 states. 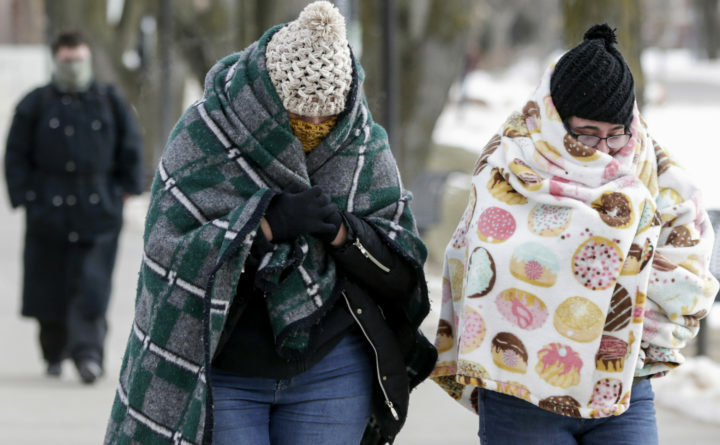 The quirky behavior of the polar vortex is caused by a dip in the jet stream and is associated with a warm air mass that pulsed north into Alaska, said Jason Furtado, an assistant professor of meteorology at the University of Oklahoma. Whatever the precise cause, the timing is unfortunate. “I think people this year are less prepared for this kind of cold wave, and especially in some areas where things started to bud and blossom,” Furtado said. The fist of cold Arctic air is being escorted by a cross-continental storm system steadily heading east. The early phase of the storm has been delivering heavy rain in California and snow in the Sierras. The storm system could produce flash flooding and heavy thunderstorms in the Southeast. And cities along the Northeast Corridor, including Philadelphia, New York and Boston, could see some of the heaviest snow of the winter. Boston, which was buried in more than 100 inches of snow four years ago but has been largely spared so far this year, is poised to get abundant snowfall Sunday night, and close to a foot could fall in much of New England. The District of Columbia remains in its familiar, awkward position astride the rain-snow line. The forecast is necessarily squishy. Rain, sleet, snow, a blizzard, a nothingburger, or just a mild dusting that school officials reflexively view as apocalyptic: Anything looked possible as of late Saturday. In addition to being cold and stormy, America is dismayingly soggy. Tennessee, for example, is the land of flooded basements. And the big storm will send more water down the dangerously swollen Mississippi River. The U.S. Army Corps of Engineers in recent days has diverted water from the river to ease the flooding hazards in New Orleans and other downstream cities. Greg Carbin, a meteorologist with the National Weather Service, said February set a record in the continental United States for the proportion of the country that received more than 10 inches of rain. That is a huge amount of rain in just four weeks, and by his tabulation, 5.5 percent of the country reached or exceeded that mark. He noted that the records date only to 1969, but it is remarkable that the past three Februaries have been historically very wet. Washington Post writer Jason Samenow contributed to this report.